Indulge him with a gift of scent of fragrance and flowers. 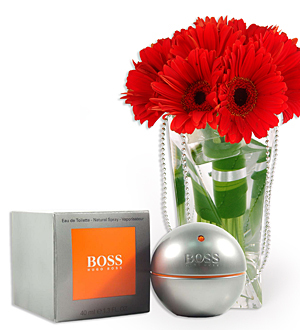 A bottle of Boss in Motion Eau De Toilette 90ml by Hugo Boss , a fresh and sensual scent for a self confident man who radiates energy and vitality. The Boss in Motion man finds pleasure in competition, believes in his own possibilities, searches for challenges and achieves his goals. He is strong and self-confident.